This series explores the sounds of performance of writing. 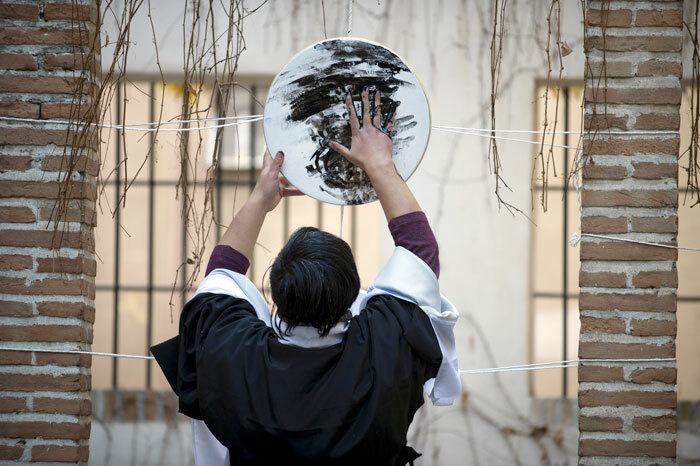 In continuous actions, which are similar to one form of shamanistic ritual, the hand or a Chinese brush beats continuously a drum, where ink makes characters visible. 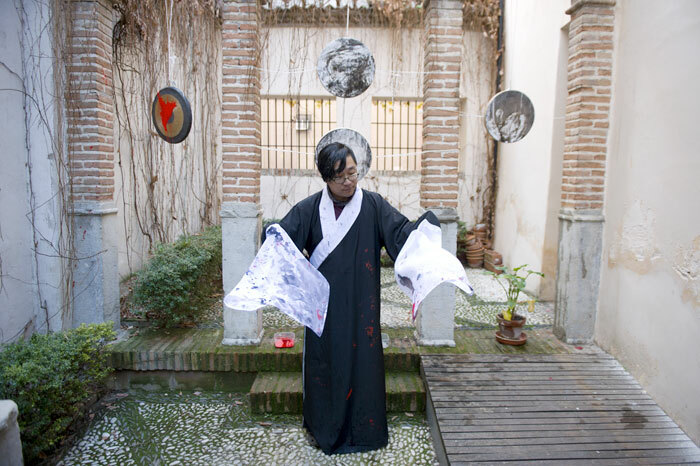 The taking shape of characters is accompanied by sounds of various kinds: the experimental vocals of Lu Dadong and the sounds created by his body, the beaten drum, and the writing objects. All this sounds can be perceived as a prolongation and enlargement of the content and form of the characters. This performances can also be looked on as a recalling of the spirit of the tradition of performance in classical calligraphy, which had vanished gradually through the centuries. Lu Dadong is a young artist born in Yantai, Shandong, PR China in 1973 and is based in Hangzhou. 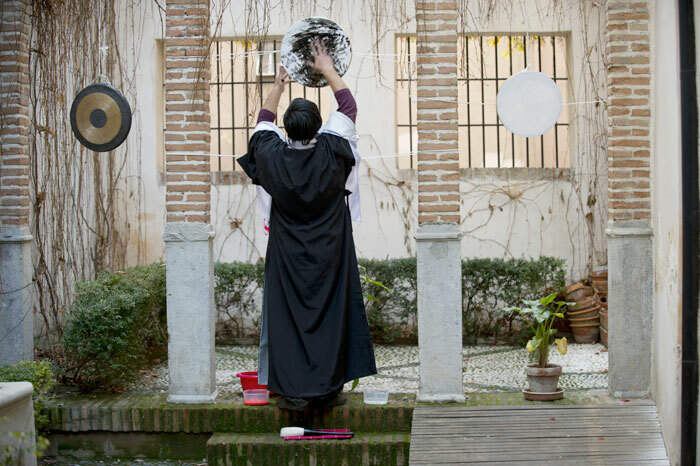 He has a Bachelor of Literature at the Department of Chinese Painting, China Academy of Art, Hangzhou and he earned a Master of Literature in 2006 at the Department of Calligraphy of the same Academy. 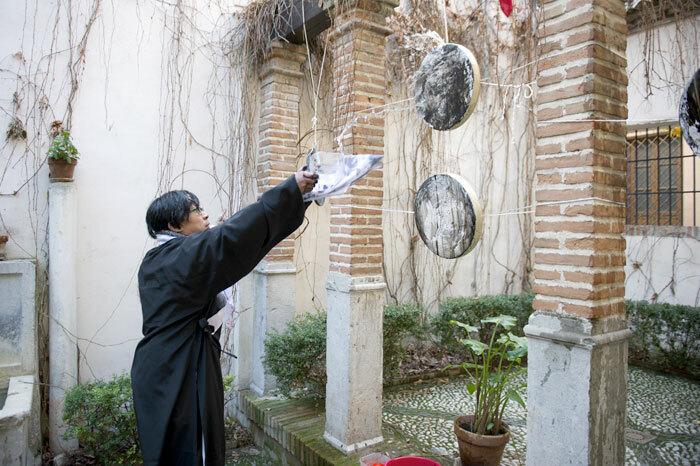 He has held several exhibitions like the International Biennale of Contemporary Calligraphy. China Academy of Art, Hangzhou (1995), Diushiing, meilost (Loseing, not lost). Contemporary art exhibition. Loft 49 (Hangzhou), Shu · feishu (Calligraphy · Not-Kalligraphie). International exhibition of contemporary calligraphy, Art Museum ot the China Academy of Art (Hangzhou), Huanghezi · Qingpu (Yellow Box · Qingpu). Contemporary art exhibition in the space of old buildings. 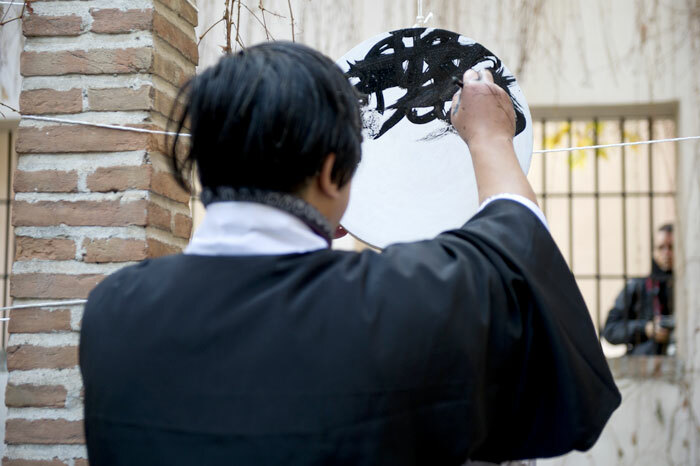 Qingpu, (Shanghai), Ping’an ye (Christmas Eve), Calligraphy event and exhibition. Henglu Art Museum, (Hangzhou) Kai Fun (Beginning Fun). Contemporary calligraphy exhibition. Taipei City Art Museum, (Taiwan), Guiling (Zero Point). Contemporary art exhibition. Hongmiao Art Gallery, (Shanghai), Chugui (Derailed). Contemporary art exhibition in the base of an unfinished highrise. Hefei, (Anhui), Siji (Four seasons). 80th anniversary exhibition of the the China Academy of Art, (Hangzhou), Croisements. Contemporary calligraphy Exhibition with Catherine Denis. Calligraphy-sound performance. 1918 Art Space, (Shanghai), Shanghai eArts Festival 2008. Collective sound performance. (Shanghai), Shu · feishu (Calligraphy · Not-Kalligraphie). International exhibition of contemporary calligraphy. Art Museum ot the China Academy of Art, (Hangzhou), CUTURESCAPES 2010 China. Solo exhibition. Waldshut-Thiengen, (Germany). Lu Dadong is also a singer and leader of the underground rock-band Yuren yuedui (with the people) that in 2007 released the CD Yushi jujin???? (Always reatrained).